Lock in your food's freshness with this Cambro RFSC1148 snap on cover! This tight fitting cover is for 1 qt. round, white storage containers. Its tight seal works to keep foods and ingredients uncontaminated and organized for your convenience! 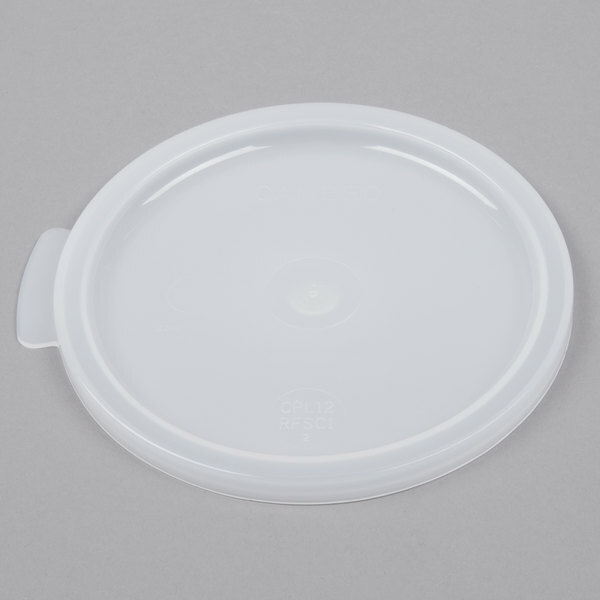 This lid is critical for the round white food storage container. It is a snug fit so will keep your product fresh. We recommend it. 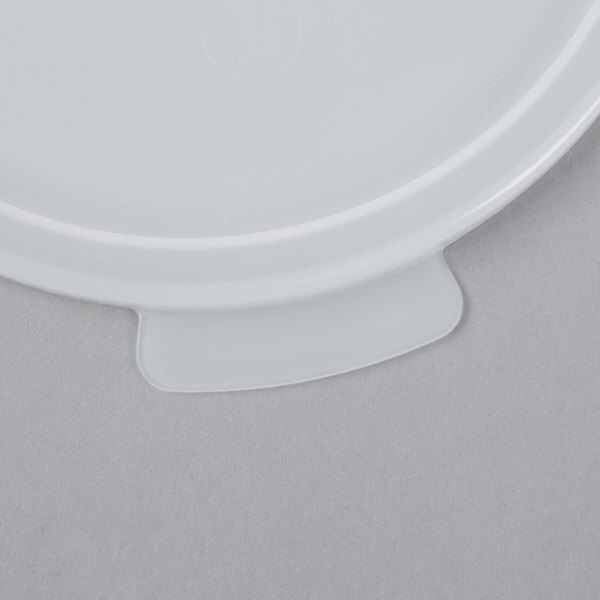 Easy to snap on, this Cambro 1 Quart White Round Lid is ordered separately from the base. This lid is freezer safe, dishwasher safe, and it keeps food products more fresh because it is airtight. This lid is a perfect fit for Cambor's 1 Qt. food storage containers. It creates a tight seal to ensure the food or ingredients you're storing remain fresh. I love the tab on the side of the lid – it makes it incredibly easy to open. This is basically a required accessory for a 1 quart Cambro container. They are made of Polyethylene, and fit nice and tightly on the container without being difficult to remove. There is a tab on one side of the lid to help make removal of the lid easy as well. 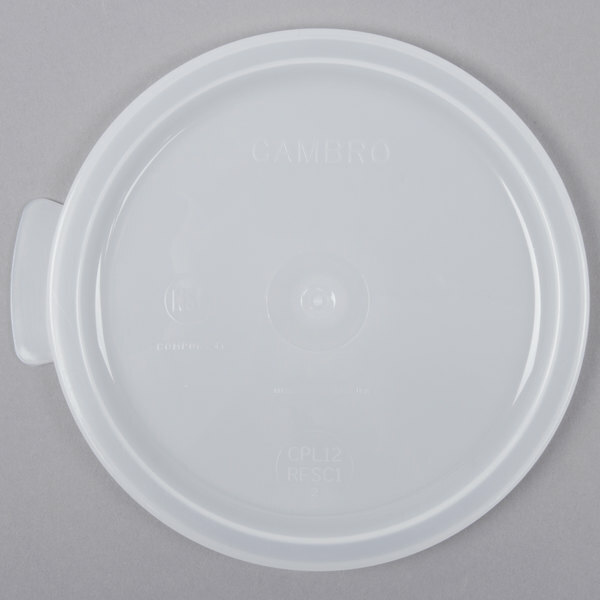 This white round lid will fit the Cambro 1 quart storage container. The lid will help protect the contents of the food storage container and will ensure they are not contaminated. Lids also make it possible to stack containers when in the refrigerator. It works. Keeps the good good in the round, but don't get too rowdy. It will fly off and leave you dripping with blackberry compote. Given proper consideration, however, these lids are gold. A indicated in the Cambro RFS1148 review, these are excellent well made projects. They hold up very well in the dishwasher and the microware. I highly recommend them. Nice lid that fits snug and won't slip off or allow spills to occur. It has a nice dip so you can stack other 1 qt. containers on top of it. Works in the freezer too. I love this lid because it can work on many bowls making it safe for storage and any other supplies. This product is very well made and I would highly recommend. The Cambro 1 Qt. White Round Lid fits the container that I that I purchased. It has a great seal, so I don't have to worry about anything getting into my container. The price and quality are excellent. Not a whole lot I can say about a lid, but it fits my 1 qt container perfectly. It's tight, but not tight enough that it's difficult to take off. Making sure you have the proper lid to fit a container is important. This lid is made of strong plastic and seals up nicely. Fits a 1 QT Cambridge container. Great Cambro quality as expected. I have these in various sizes in the translucent, nice to know they are interchangeable. Beats the cheap plastic storage containers at the BigBox Marts by price and quality. The lid fits nicely and is easy to take off with the large flap. The seal is very tight. It's also made in America ! 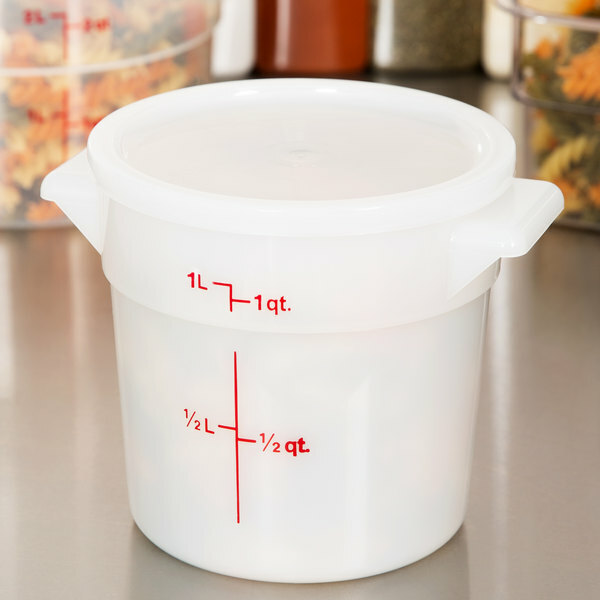 A must for the Cambro 1 quart food storage round containers. 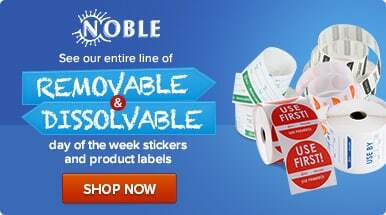 Sturdy & durable, easy to wash & use. Great price, bulk discounts, fast shipping. This is a good basic lid, and a must have for the containers. Make stacking and using the containers go much farther then without them. We used this lid paired with the 1 quart Cambro storage container. It has worked out great and keeps our brown sugar sealed up tight and ready to use when needed. Required lid for the container. Well made and solid, just wish they were bundled with the containers instead. Translucent is nice because you can get an idea of what's inside. This is the top you should buy to complete the 1 quart bottom. It fits snug and is hard for little ones to open, I tried this. And they cannot!!!!!! I dropped one with top and bottom on my kitchen slate floor and it stayed all in one piece and nothing came spilling out ( pasta sauce). The price again is fantastic buy more than one or two as you will see there many uses for these containers. It also contains a red embossed reading of how much is in the container. Also the bigger sizes are even much more impressive to purchase. Try them out, you'll be happy you did. This smaller lid is of the same quality as the larger lids. It creates a tight seal with the coordinating bucket. I haven't had any issues with moisture getting in. Cambro quality can't be beat. We always order one more lid than container because they seem to disappear. I wonder if they are with all my onesy socks. These lids seal tight and secure. I would however suggest buying a spare as they are so inexpensive and if you use them a lot the seal will wear a bit.